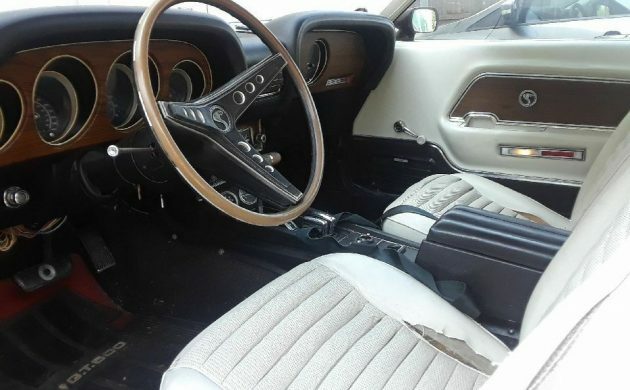 This 1969 Shelby GT500 is a claimed survivor, with healthy documentation going back to the day it was bought new. 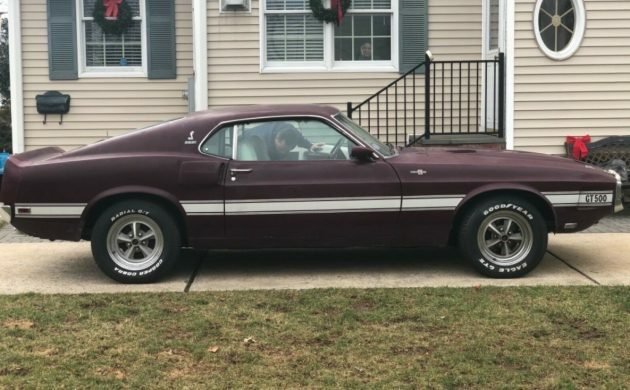 The seller is a self-proclaimed Mustang enthusiast and notes that this GT500 is a rare Drag Pack car with 3/4 of its original paint still attached. 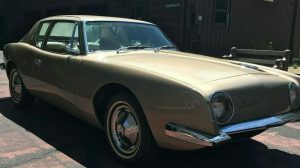 The original engine was swapped out by the first owner who bought a 427 side-oiler from the selling dealer and had it installed. With all those OEM enhancements, it’s sure to be a fun ride. Find it here on eBay with bidding over $45K and the reserve unmet. The car is tatty in all the right ways, just signs of use rather than wanton neglect. The seller notes the original radio still functions, although the Tilt-Away wheel – while present – no longer works. The driver’s sat has a tear, and it looks like the passenger seat does as well. These are minor quibbles and easily fixed. The dash doesn’t appear to show any cracks and the door panels present nicely. Where you stand on the engine swap is a matter of personal preference, but at least it was performed early in the car’s life and via a dealer replacement. 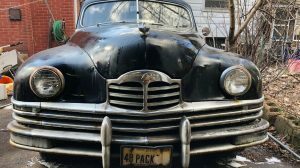 The seller notes some original accessories remain attached, along with the carburetor and the distributor – although an Edelbrock intake manifold has been added. The original radiator even remains with the car, although the seller has thankfully replaced the upper ball joints, brakes, and tires. It’s not really mentioned in the listing but the GT500 looks quite solid underneath. The floors are said to be in excellent condition with the only rust noted on the right-side rear quarter panel. With just 68,000 miles and only three recorded owners since new, this is likely one of the more preserved GT500s to come up for auction recently, and it’s not surprising to see plenty of bidders lining up for a shot at it. sweet power-filled “survivor” right here. the extra 100-ish hp from the 427 over the 428 must’ve been a blast at the track, less so on the street. I have recently seen and owned better for less! Original 1969/1970’s are not that rare. The 427 is a plus to some but a big problem with the purist! Yeah But if he’s got Documentation that it was a DEALER Option installed that Should Add some Value to the car as it makes it kind of Unusual. Does anyone know if the Shelby 427 ever came with dual overhead cams? I thought I read it in Mustang Does It however cannot locate 40 years later. 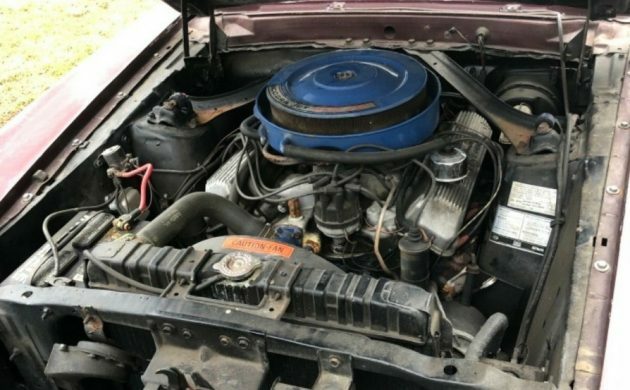 Ford made a SOHC 427, but it was only available over the counter. I own Chevys and a Mopar, don’t think much of Fords. But if I was going to have a Ford, this would be it. Other than a 427 Cammer, the 427 side oiler is the top of the heap. I can’t see a period correct, dealer installed, side oiler hurting the value much if at all, especially if there is the documentation that is promised. The original owner probably lost a few races with the original 428 and decided to fix the problem. A guy I knew in the early 1970’s had a 428 Torino kick a rod out through the block going down the interstate. (I have to admit that he was on the way home from the drag strip) He put a 351 Cleveland in it and it ran a couple tenths better than the 428 ever did. The 428 not being a world beater would explain why he put the 427 side oiler in it. I dunno, back in high school, nothing but nothing would keep up with my 428 Mach 1, that included 396 Chevelles, 427BB cars, 440 Mags, etc. I never got beaten, not once. Now, a 427 sideoiler or SOC could have, but never found one to run against. I never ran it against my 426 Hemi, as the Cuda disintegrated before I got the chance, but they felt pretty close :) that 428 is a trooper too, it still runs strong, even with a LOT of abuse and is still stronger than the same year 427 390hp Vette, which is fun, but not nearly the balls to the wall experience as the 428SCJ. As Duane said, 69/70 Shelbys are not worth as much as the earlier ones. They were built by Ford with a Shelby name, the early ones were modified by Shelby. The single overhead cam 427 (“SOHC” or “Cammer”) was never put in a street car by Ford. It was their answer to the Mopar Hemi, but by the time they got it done, NASCAR had outlawed it. They were all crate motors, they were mostly drag raced. One local guy put one in a 69 Mach One around 1970. That took some cutting and fabrication. He got a couple blocks into town with it before the cops saw it. It was mostly legal, but they told him to turn around and go back where he came from or they would find a reason to arrest him. As far as I know it’s still sitting in his garage and it’s never going to be for sale. He’s a couple years older than me, so if I see an estate sale ad I know where I’m going. Must be a small town, tho today one or at least “the right person” might be able to sue the cop for doing or even saying something like that especially if u record him. Today, cops let all sorts of exhaust noise “slide”, regardless of how obnoxious. &/or they are just not around – i rarely see them these days, at least in my area, compared to 40 years ago. Also, do you notice how many not that old modern cars have an exhaust leak UP FRONT by the motor? & how many annoying non leaking sounding exhausts there are? – most 4 cyl’s & v6’s sound like crap with a “performance” muffler. 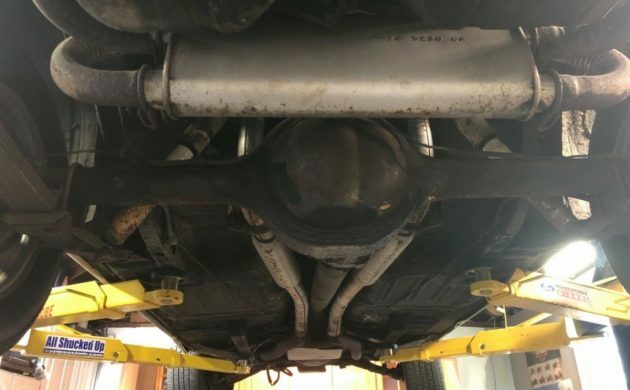 That exhaust system above looks similar to the one on the ’73-4 sd-455 firebirds. I wonder how restrictive it is. Interesting Mustang, now that is the color I’d have ordered, but with black interior. The 428 super cobra jet weren’t no slouch, Ford’s best street mill at the time, a 427 wasn’t available in any Ford product in 1969 as far as I know but so what, really. That 427 would really scream, but I can’t believe they left that restrictive exhaust system on it. To me this would have been in it’s best shape with open headers and a set of slicks. Really nice car. You are correct. The last production vehicle that left a Ford factory with a 427 in it was a 1968 Mercury Cougar GTE. I am surprised that the 427 didn’t scatter that C-6 all over the pavement…that being said, betcha this car was scary fast…love this find! If I had any youth, this is where I’d be putting my bet. I think you would be mobbed with questions every time you took it out, not being a trailer queen makes it alot more friendly to approach. Finish the drive, then just park it, just like you did before. Damn age, got the money but not the desire anymore. Gonna be interesting to see what it goes for. This is a go-fast monster,automatic is all that’s needed. The horsepower that is here, and “lightweight” Ford body is probably why they call these drag-pack Cobra Jets! ebay add says drag pack car, it has the oil cooler on it, only 1 horn, I thought the drag pack cars had the LHS shock absorber behind the diff housing, and no mention of drag pack on Marti report?? Staggered shocks only on manual trans cars, and yes it is missing one or both correct horns. Should both be on RH side. Had a ‘68 427 Tunnel Port. Had it dyno’d at 546 HP. It’s siting in a ‘67 Shelby GT500. Great and rare engine. The cross bolts made the bottom half indestructible. Mr white .. as an employee of ford motor .. I have had access to some amazing people . Who where involved in that era of speed and torque . This was 15 years before my time with ford . I have been invoked with many higher end mustangs. There was only two ways to get the oil cooler ans that was due to rear gear choice while my car has the 3:91 gear set the other choice was I believe 410 .at the time ford didn’t put a/c in those cars for fear that their rev happy customers would explode the ac compressors and increase warranty costs . True story ford never marketed the the drag pack as a drag pack that name was given to the car by the fans of it as far as the shock relocation .. I’ve never seen or heard of it .. I could be wrong . It was 50 years ago and at that time ford just wanted to win races .. fords motto at the time was winning races means selling cars .. if you have info on that please share with us ..
Ford staggered the rear shocks on certain high performance models with a 4 speed. Mustangs and Cougars with a Boss 302, Boss 429, 428CJ, 428SCJ, 429CJ and 429SCJ with a 4 speed will have them. I once parted out a 71 Cougar XR-7 with an M code 351 and automatic that had staggered shocks as well. I still have the upper shock mounting bracket from that car. As I understand it Ford staggered the shocks to help improve traction and to reduce wheel hop. I don’t want to seem ignorant, but what is a side oiler ? Google “427 side oiler” for a good explanation. The long and short of it is a typical engine pumps oil to the top and it gravity feeds back down to the pan, where the process repeats over and over. A side oiler has oil galleys that allow the pump to push the oil into the various areas “sideways”, rather than just let gravity work its vertical magic. With more “positive” oiling, the engineers could then amp up other parts of the engine to levels the gravity feed oiling risked failing in during high stress applications. At the tender age of 5, my best and I were car crazy punks in 1966. It was a good time to be a car crazy kid. So many wonderful cars on the road as everyday drivers. The dealerships were full of awesome cars. It was pretty exciting times. This friend and I talked our mothers into letting us go attack a selected dealership along their route of errand running, dropping us off on a certain corner and picking us back up at the same spot at a pre-selected time. My friend liked Shelbys and we spent a good amount of time annoying the sales staff at Metke Ford, collecting sale lit, and pouring over the cars we liked. I took a shine to 66-70 B-body Mopars and loved to harass the crew down at B.C. Hawk Dodge for all the same reasons. Never realizing we were riding the crest of the golden age of the American automobile, my friend said he was going to get a Shelby when he could drive. We both though they’d be making them forever, right ? I don’t remember making such a claim about the Dodges, but he followed through and bought a pampered 10-year-old 67 GT500 and I got a 66 Coronet 440 convertible. Still got it too. We haven’t spoken in years. Not sure if he still has his Shelby. Another guy testing the waters–do you want to sell or not? If not go someplace else. Sorry for the negativity but I’ve got a gut full of people like you. I’m sure you will want twice what its worth if you do decide to sell. John and GPC, no need to squabble over this. I have always said there are three prices that matter on a car. What the seller wants, what the buyer will pay, and what they complete the deal with. If John keeps or sells the car will depend on the price he settles for. As the owner he holds all the cards. I hope you either get rich off it or enjoy it for years to come, John! Thanks, No squabble here. I wish John I good luck on the sale of his car. Just voicing my opinion of another thing that I don’t see eye to eye with. No one expects you to give your car away, and its only worth what someone will pay for it, The sale price is what its worth. I’m just not a fan of testing the waters vs. putting it out there for sale. Good luck! !